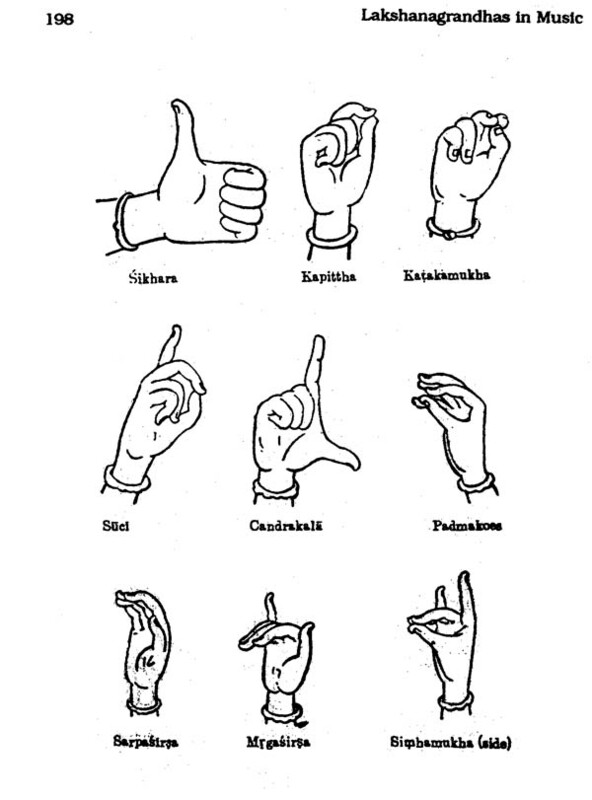 Lakshanagrandhas form the basis for the understanding of the theory and practice of classical arts. A study of the evolution of these classics bring to light the depth of knowledge and scientific principles lying in ancient Indian arts and how these principle of these Lakshanagrandhas. The heritage of classical music and dramaturgy has been kept alive through these lakshanagrandhas. The work starts with the chapter on the origin, evolution and development of the classical theory of Music and Dramaturgy, prior to Bharatha's period, i.e. from the Vedic period to the Epic age. 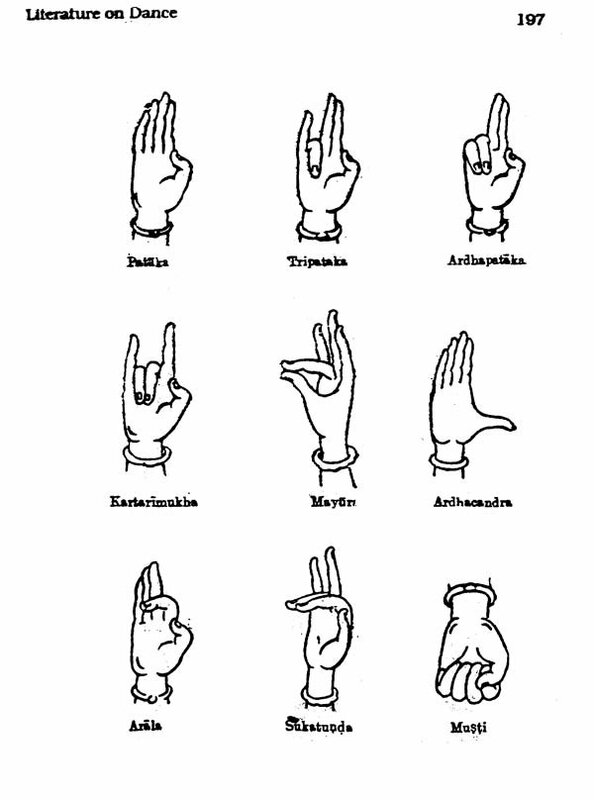 The chapter traces the development of sapta svara system and the development of dramaturgy through the classical of Sanskrit language and literature. The chapter encompasses as a whole the history and evolution of the existing thought on Music and Dramaturgy. The chapter forms a foundation for the understanding of the evolution of lakshanagrandhas and lakshanakaras. A brief chapter on Evolution of Lakshanagrandhas and Lakshanakaras, could not be avoided as their contribution as a whole to the development of lakshana in music could not be underestimated. The chapter makes only a brief mention of these lakshanakaras, as the Information available on them is peripheral and material sources virtually unavailable. However I have tried to encompass as much information on these lakshanakaras and their contribution to musicology. The later chapters deal exclusively with each lakshanagrandha in particular. Each chapter begins with a brief resume of the lakshanakara, an analytical and critical evaluation of the lakshanagrandha and various details and evaluation of the text as a whole. Then it goes on to a deeper study of the various concepts of svara, raga Sruti etc. 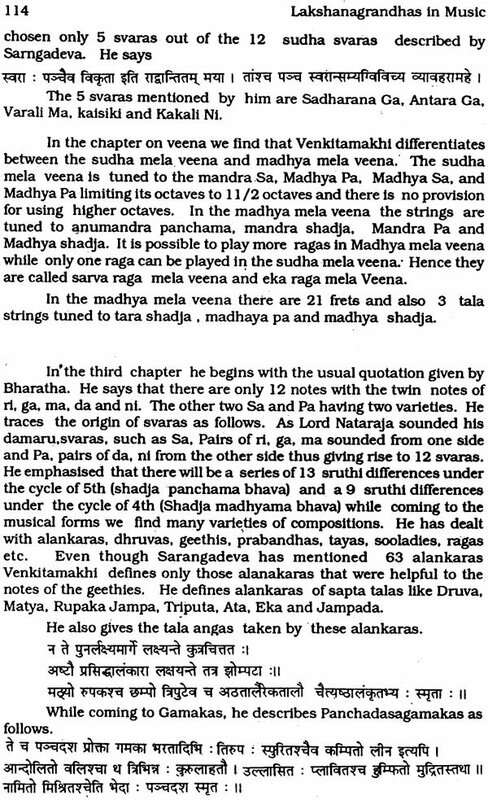 and how each lakshanakara has evaluated each aspect of music. The lakshanagrandha has been treated in such a way that the learner is able to understand the basic concepts in each treatise, the importance and relevance of the treatise in relation to the existing school of thought. 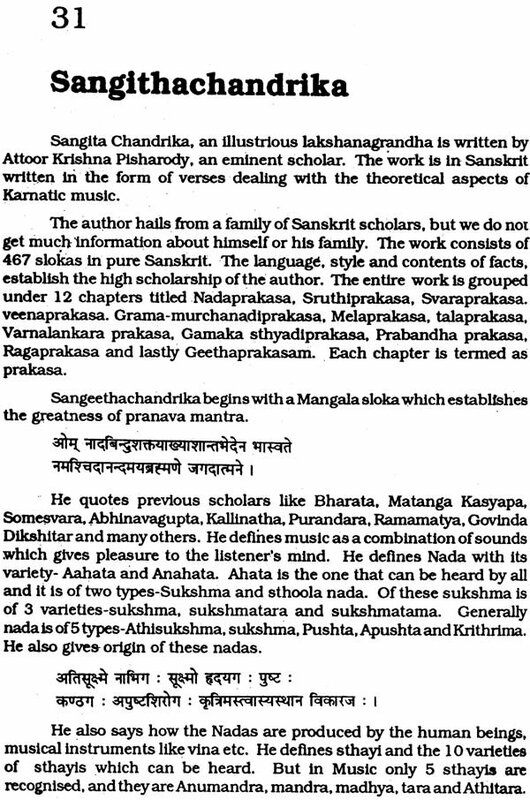 The chapter ends with a note on the importance of each lakshanagrandha and its merits. The chapter on Music in Tamil literature was felt essential as we cannot forget the importance of Tamil literature of the concepts of drama and dramaturgy is made in respective lakshanagrandhas, I felt that a separate chapter will be ideal to treat treatises which deal exclusively with dance and its contribution to classical arts and dramaturgy. Briefly I have tried to include as much relevant material as possible. 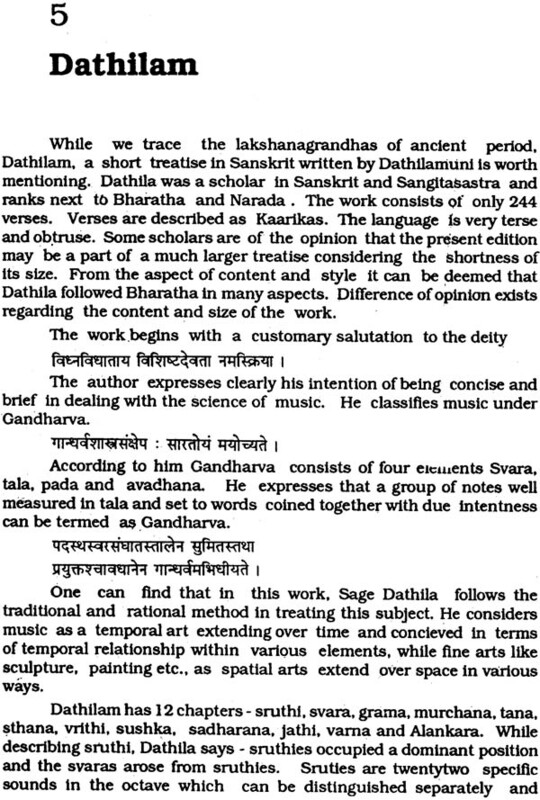 Dance Literature forms as essential part of the evolution pf lakshana in music. Through detailed analysis of the concepts of drama and dramaturgy is made in respective lakshanagrandhas, I felt that a separate chapter will be ideal to treat treatises which deal exclusively with dance and its various aspects like, Abnianaya Darpanam, Balarama Bharatam etc. 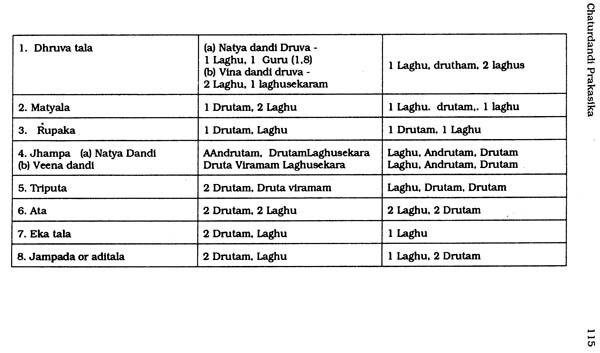 Accordingly in this chapter I have tried to evaluate these lakshanagrandhas in brief, detailing their important contribution to dance literature. In dealing with the lakshanagrandhas I have tried to highlight in the importance of each lakshanagrandha. In making such a study I have included charts and tables which I felt would convey the ideas of the lakshanakaras to the fullest extent. In doing so I have retained the original order in which the treatise dealt with specific aspect like, the rages existing during its time, alphabetization of the raga names etc. in been kept to the original Sanskrit alphabets though English listing has been used. During the initial stages, when I was in search of basic source materials on Lakshanagrandhas I received great help from Sri. T.S Parthasarathy, as to the available sources and reference materials. I am deeply indebted to Sri. T.S. Parthasarathy for the advice and guidance he gave me. Though the search for critical editions of Lakshanagrandhas was difficult, I could get hold of few excellent editions of various treatises. I feel obliged to the editors of these treatises. These critical editions of difficult Lakshanagrandhas have been much helpful to me in understanding many difficult concepts and interpreting them. I thank, Dr. M. Hariharan, who took some time in going through the final manuscript and gave valuable suggestions for its improvement. I am thankful to him. I record my gratitude to Shri K. Balasubramohiam the young artist who helped me with sketches of the karanas. I am also grateful to Mr. Radhakrishnan, who typed the articles patiently many times and I am indebted to my brother Sri. M.N.Moorthy who helped me in typing fair copies of the manuscript. I an deeply indebted to Sri. M. Easwaran, my brother for the great perseverance with which he went through the editing of the manuscript and various stages of production of the book. I sincerely appreciate the effort made by Smt. M. Girija, Proprietor, CBH Publication of the book in record time. I will be much gratified if teachers, students, and lovers of classical arts who have welcomed my earlier publications, accept this humble attempt also with goodwill. Any shortcomings that may have crept into the text, is entirely mine and I request the user to bring same to my notice. Classical arts of India represent the ideal blend of improvisation and discipline of culture. This discipline emanates from the strict adherence to rules enumerated in the sastras and the improvisation comes from the innovative genius of the performing artist. The rendering of a raga or svara has to conform to certain rules, but within this framework the artist has immense scope for innovation and display of his creative talents. It is the Lakshanagrandhas in music which provide the disciplinary basis for classical music and dance. In other words these treatises provide the structural framework relating to rendering of these arts. The word 'Sastra means commandment. 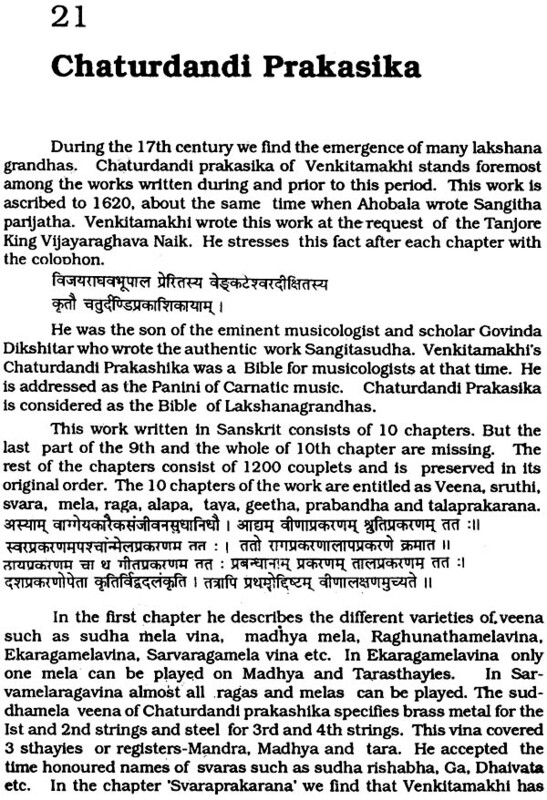 The tern lakshanagrandha means a grandha or a treatise which deals with the lakshana or principle of a subject. 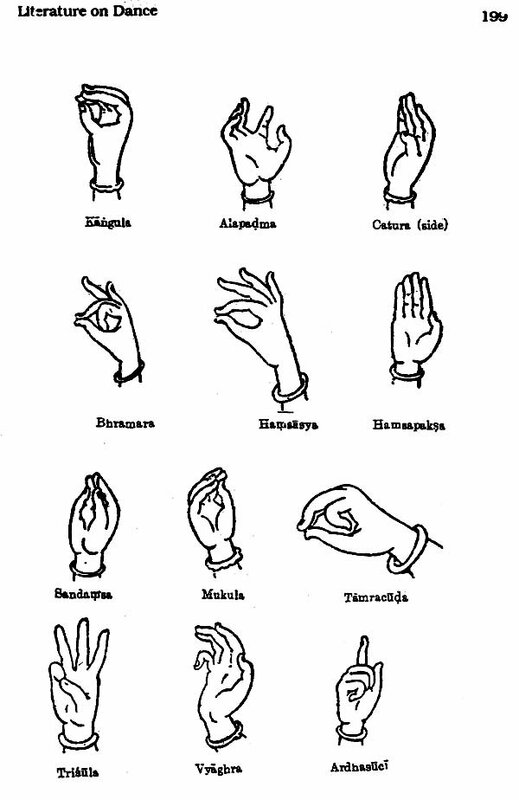 The word 'Lakshana' denotes the features facilitating perception. Without certain rules which are meticulously followed by great artists, these classical arts lose their identity and value. Westerners find it difficult to believe and understand the rigorous training given in certain schools of classical music and dance in India. It is really astonishing to find that Lakshanagrandhas deal with each and every aspect of classical arts like dress, make-up, background, stage condition, voice, instrument, qualities required of artists, teachers, rasikas and so on. Authors of Lakshanagrandhas have taken great pains to make a scientific and systematic study of art forms and provide useful classifications. Even today after centuries of technical and scientific progress, our classical arts derive their strength and vitality from these classical works. These classical art forms own their original identity and special qualities and most of their purity to the scientific principles enunciated in these Lakshanagrandhas. Reference to music and dance are seen in the Vedas, the earliest Indian literature which from the basis for later Indian Literature. So they are the earliest documents available to trace the history of music and Dance in India. During the long phase of its historical development, music has undergone various changes since its inception to the present day. Though the lakshanagrandhas provide valuable information and insight into the forms of music; they also pave the way for an analytical and critical discussion on the theory and practice of music. Since music was associated with religion, Sangita literature also became associated with religion. Sangitha is sacred in nature. The rich treasury of Sangita literature can be broadly classified under three heads, ancient, medieval and modern. Ancient period ranges from Vedic period to the period of Matanga i.e. upto the 9th century A.D. Medieval period ranges from Matanga to Purandaradasa i.e. upto 16th century. Modern period begins from Purandaradasa and continues to the present day. The lakshana grandhas on music also can be broadly grouped under two heads Sacred Literature and Secular literature. The Sacred literature gives very important reference to music in its spiritual, religious, emotional, psychological and sociological aspects. There is not even a single treatise in Indian sacred literature which does not dwell on music. The stray reference obtained here and there enable us to understand the rank and status of music during these different periods. These grandhas throw light on the origin, development and progress of music during these centuries and many of them help us in fixing the exact date and year of facts on music, theories, accepted concepts, and details of lakshanakaras. Just as the history of mankind can be traced back to the prehistory times, the roots of lakshanagrandhas can also be traced back to the pre-vedic period. 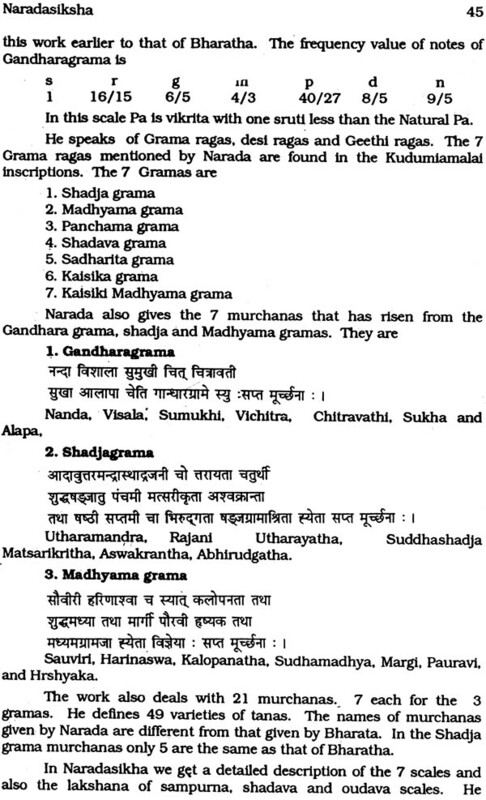 On a through analysis of the lakshanagrandhas we find that they are of there types. The works written in ancient period gave more importance to Dance and Drama and devoted only few chapters for the treatment of music. They can be grouped as Natya literature. 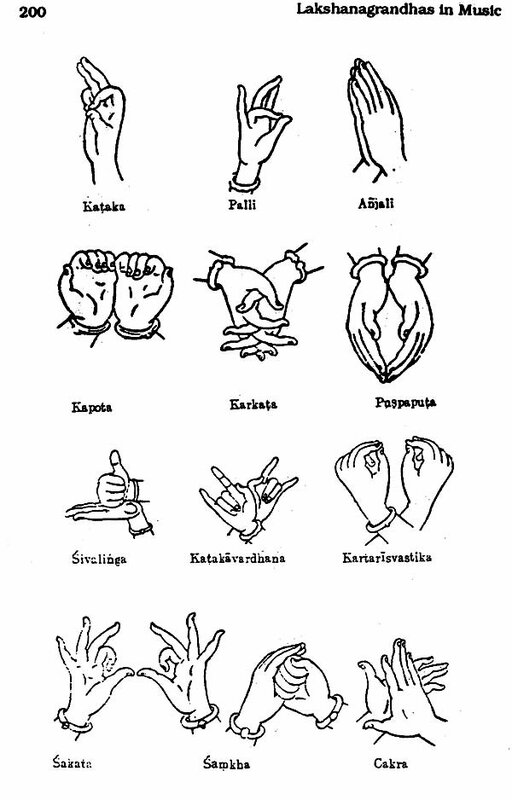 The works written upto the time of Matanga are based on this aspect. The second group of works written during the medieval period were Gita-Natya literature. During this period importance was given to Music. Writers devoted more attention to music and we find very few grandhas dealing with aspects of dance. This may be due to the fact that Sangita or music incorporated in it, the three aspects, Gita, Vadya and Nritta. All the lakshanakaras deal with sangita in this aspect. The works written during the modern period were purely Gita literature. Music was given prominence and the works fully extol the techniques of music. During the ancient period music was sacred and religious in nature. It was used for religious worship and was associated with temple worship and rituals. Music was treated as an applied art and considered as most sacred in form. During the medieval period, foreign invasions influenced the system of our music. Its form and structure slowly changed. Music spread among common people and the spirit secularism entered into it. 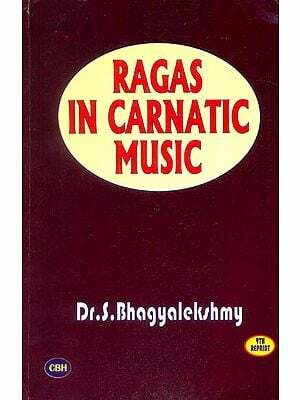 It was during this period that the bifurcation of music into Carnatic and Hindusthani style came into existence. Compositions and forms intended exclusively for these two systems were composed in plenty. 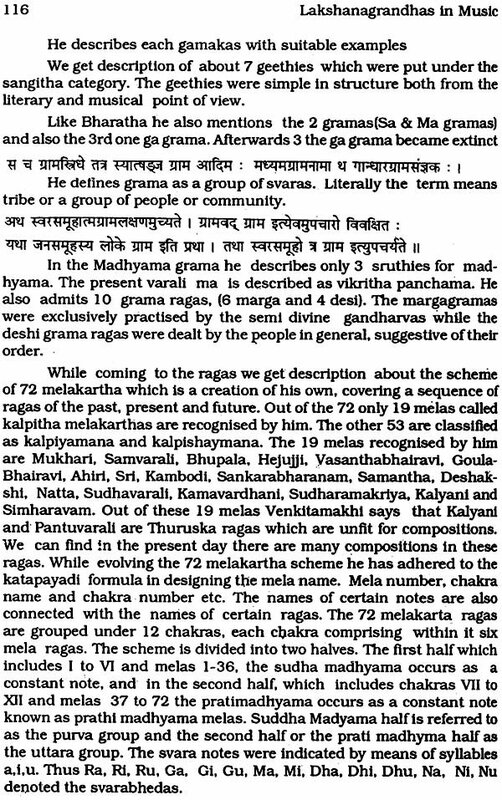 Naturally the Lakshanagrandhas written during this period also followed the prevailing trend and practice. During the modern period, practical application became more dominant. In works written during this period more tress was laid on the raga alapana. New musical forms, improvisation, svara and tala prastara. 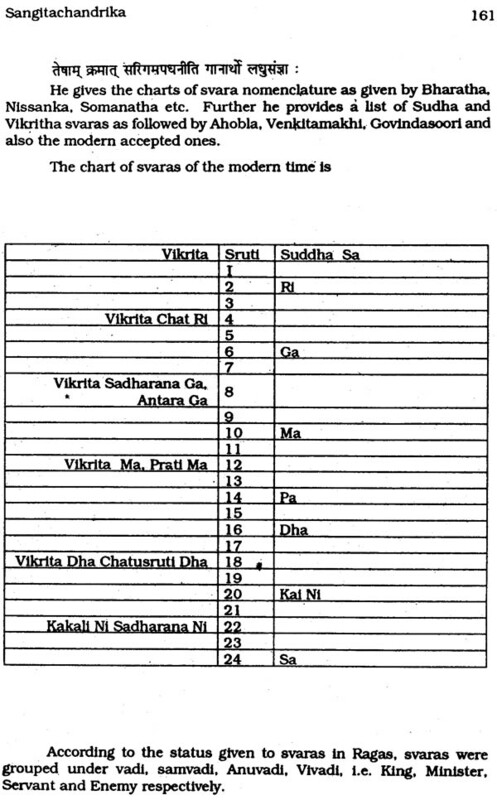 Separate charters chapters have been devoted for describing svara, tala prastara and the like. New raga systems and mela schemes emerged. 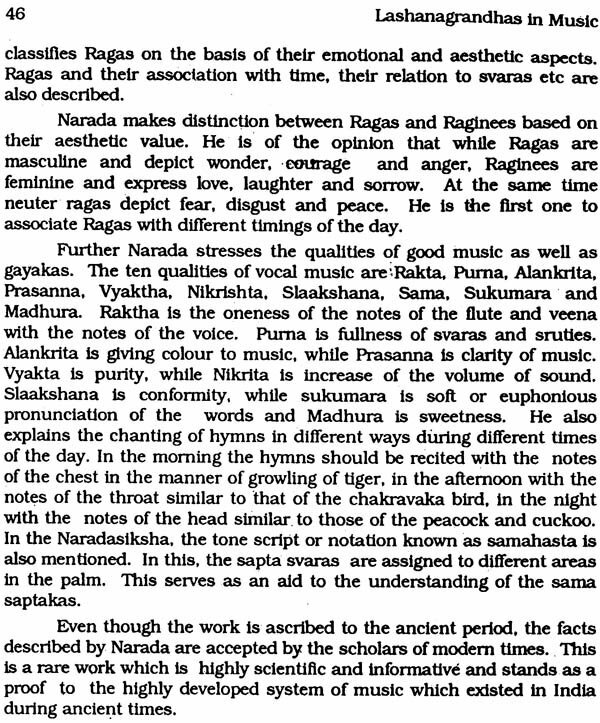 Classification of Ragas in a systems and scientific manner was explained with examples and finer details. The period also witnessed the development of practical aspect of music. Hundreds of compositions were composed by eminent vaggeyakaras. 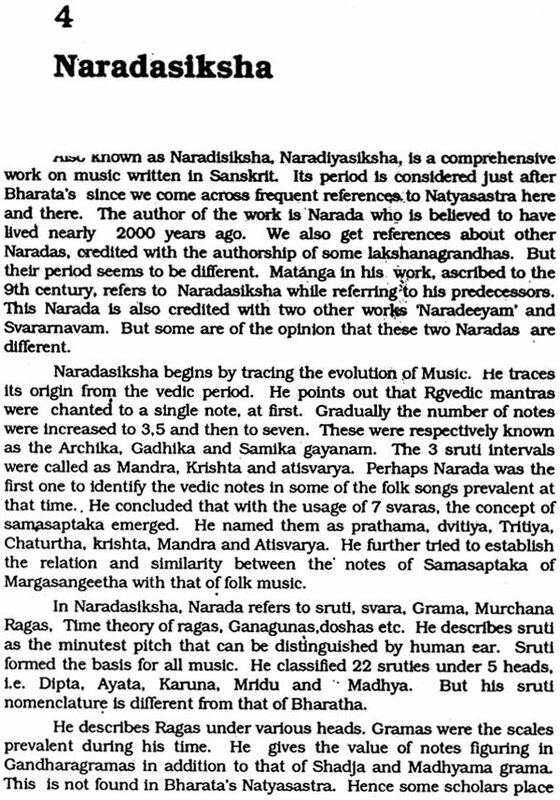 The 'Golden Era' of Carnatic Music i.e. the 17the and 18th century was an important phase of the modern period. Based on historical grounds, the Lakshanagrandhas can be grouped under three 3 periods-Hindu period, Mughal period and British period. The Hindu period extended from Rigvedic period to Pre-Sangita Ratnakara period. This period witnessed the emergence of numerous Lakshanagrandhas, musical works, Geya Natakas (musical dramas) and Nrityanatakas (dance dramas) in Sanskrit, Tamil and Telugu. The Mughal period witnessed the bifurcation of Indian Music into Hindusthani and Carnatic Music. While music of the North was highly influenced by Persian and Islamic culture, the Carnatic Music took stable roots in the southern regions without deviating much from tradition. Since the system spread in the regions of Karnataka it came to be known as Karnataka sangitha. The British period contributed western influences and fusion of western influence into our Music. The introduction of violin and clarionet was the result of such western influence.